Abstract: Pogonomyrmex badius (Latreille)was considered to be a relatively common species in central and southern Mississippi before the introduction of the imported fire ants, Solenopsis invicta and S. richteri, and before subsequent area wide control measures, but it has not been reported from the mainland since the mid 1930's. Recent collections in a relic sandhill community in Smith County have resulted in the rediscovery of this species in central Mississippi. Colony characteristics and microhabitat of P. badius are described. Observations of P. badius and other ant species found walking on the P. badius craters are provided. Seeds found in middens and caches were identified, and charcoal pieces found on the mounds were identified and measured. Species of Pogonomyrmex (Hymenoptera: Formicidae: Myrmicinae) are collectively called harvester ants because they clip seeds off of plants with their mandibles and gather seeds that have fallen to the ground for food. 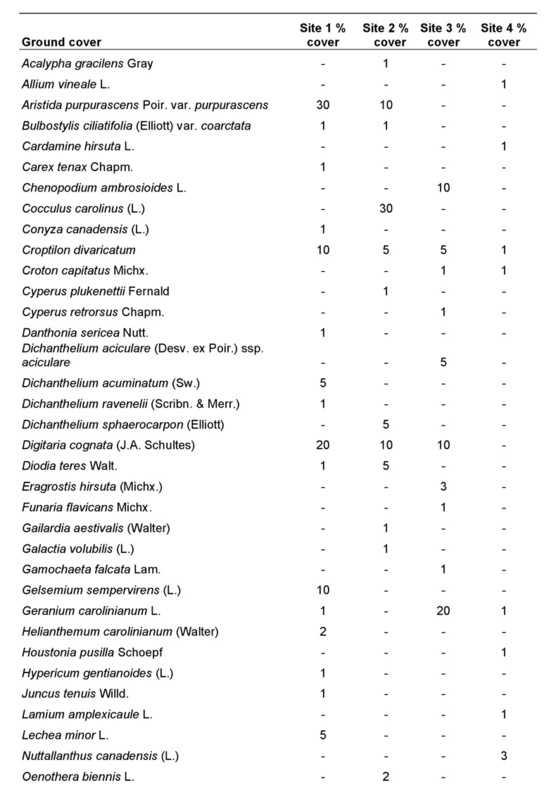 They also supplement their diet with various arthropods (Nickerson 1987). Colonies are found in the soil in open areas that are fully exposed to the sun. Nests are surmounted by small to large mounds, which may be craterlike, and are often covered with gravel and other debris. Some species clear vegetation near the nest area, making their nests conspicuous. Pogonomyrmex includes 24 species in the United States (Taber 1998), but only one of these, P. badius (Latreille), the Florida harvester ant, occurs east of the Mississippi River. The known range of P. badius is from North Carolina south to Florida and west to Louisiana (Smith 1979). Its distribution within its range is limited because of its ecological requirements of nesting in well-drained sandy soil in relatively open woodlands or grassy fields. Pogonomyrmex badius (Fig. 1) differs from most other Pogonomyrmex species in that it has a polymorphic worker caste, which includes minor, media, and major workers, with the major workers possessing enlarged heads and mandibles modified for crushing seeds (Cole 1968). Queens and workers have stingers, and although they are not aggressive, their sting is considered by some to be among the most painful of all North American ants. Workers of this species usually lack propodeal spines. Figure 1. A worker of Pogonomyrmex badius. Nest entrances of Florida harvester ants are conspicuous and are surrounded by large, circular, flattened craters (or somewhat dome shaped mounds of sand), which are depressed centrally. Pebbles, bits of clay, small bits of charcoal, and various other pieces of debris may be found on and along the edges of these craters (Wray 1938). Hulled and germinating seeds may also be found in small piles on and at the edges of craters. Nests of mature colonies may be up to three meters deep with several thousand workers present (Tschinkel 1999, 2004). Historically, P. badius was documented as being a relatively common species in sandy habitats in central and southern Mississippi. Historic specimens of this species from George, Harrison, Lowndes, and Wayne Counties are stored in the Mississippi Entomological Museum (MEM), and others have been reported from Jackson, Jones, and Rankin Counties (Smith 1924). Marion Smith had additional records of this species in his notes (Smith, undated) from a variety of localities in Mississippi including Forrest, Hancock, Jasper, Monroe, Perry, Pike, and Winston Counties. All known specimens and records from mainland Mississippi are from before 1934, which predate the introduction and subsequent establishment of the exotic fire ants, Solenopsis invicta Buren and S. richteri Forel, in Mississippi. Solenopsis richteri was thought to have been introduced to the U.S. in Mobile, Alabama sometime near 1918 (Tschinkel 2006), but it wasn't until 1935 that M. R. Smith first documented its presence in Mississippi (Greene County) in his collecting notes (Smith, undated). Solenopis invicta was thought to have been introduced into the U.S. in Mobile in approximately 1933 (Tschinkel 2006), although it was several years before it became established in Mississippi. It has been postulated that P. badius was extirpated from the mainland as a result of competition from the fire ants and subsequent control efforts for fire ants including widespread aerial application of Mirex, heptachlor, and other insecticides from the late 1940's through the 1970's (Lockley 1999). This postulation was supported by the presence of P. badius on Horn Island off the coast of Mississippi in Jackson County, a location that was not subjected to these same widespread aerial applications, but where the imported fire ants are known to occur, albeit in somewhat reduced numbers (Lockley 1999). The MEM has been conducting a survey of the ants of Mississippi since 2001 in all physiographic regions of the state. Although collections were made in many suitable open habitats, including those with thick deposits of sand (including some of Smith's historic collection sites), P. badius was not found. Thus, our collections appeared to confirm the absence of P. badius from the mainland. However, recent collections in December 2006 at a relic sandhill habitat in Smith County have resulted in the rediscovery of this species on the mainland of Mississippi. Although much has been written about this species already, most of the extensive literature concerns its presence and ecology in Florida, whereas scant information is available describing habitat where this species occurs in Mississippi. Furthermore, there is a surprising paucity of information concerning plant species associated with P. badius in general. 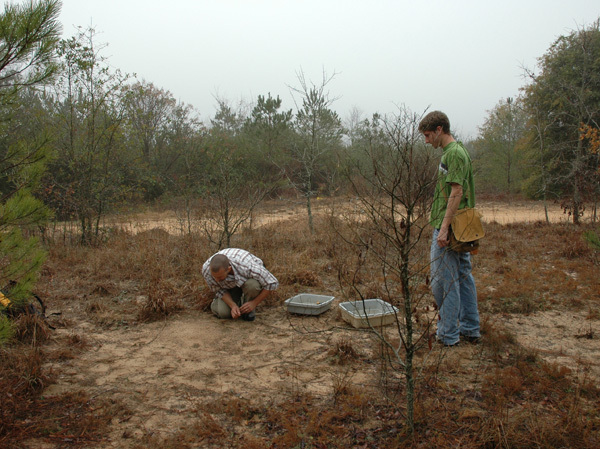 Therefore, one of the primary goals of this project was to provide baseline information on the natural history of P. badius in Mississippi with an emphasis on descriptions of microhabitat surrounding the colonies. Additionally, we present new records of seeds found in middens and caches and give identifications of charcoal pieces found on mounds. Study Sites. Harvester ant colonies were discovered at four sites within a one square km area located approximately 4.8 km north of Mize in Smith County, Mississippi. These sites were in the Piney Woods physiographic region, which in Smith County is characterized by gently rolling hills, with some high ridges capped with terrace or Citronelle deposits (Luper 1972). The Pogonomyrmex colonies reported here occurred on one of these high ridges of Citronelle deposits. The Citronelle Formation consists of reddish-orange, fine- to coarse-grained sand, chert, and quartz gravels with associated lenses of clay (Luper 1972). Each site also had an abundance of Opuntia pusilla (Haw.) (Cactaceae), as well as various grasses and other forbs, and was adjacent to larger stands of pines. Site 1 was located on a sand ridge near the edge of a gravel road at 31°52'32"N, 89°31'40"W (Fig. 2). Site 2 was located approximately 1.0 km northeast of site 1 at the edge of the gravel road at 31°53'00"N, 89°31'26"W. This site appeared to be regularly graded and was distinctly disturbed. Sites 3 and 4 were located within 15 m of one another at 31°52'58"N, 89°31'22"W, about 0.31 km southeast of site 2 on private property owned by Stephen Sullivan. These two sites were atop a high sand hill on which the timber had been cut and burned in recent years. Sampling Methods. The initial detection of the first P. badius colony at site 1 was made on 10 December 2006 by Majure. Two subsequent trips were made to the area on 14 December 2006 and 23 February 2007 to study the ants in further detail. Representative individuals of P. badius and all other species of ants observed crawling on the surface of each mound were collected and placed into vials of 90% ethanol. We hypothesized that the surrounding vegetation was important for the establishment of nest sites by Pogonomyrmex. Therefore, vegetative study plots 2.5 m in radius (using the center of each mound as the axis) were established at sites 1 and 2 on 14 December 2006 and sites 3 and 4 on 23 February 2007. Harrison and Gentry (1981) reported that P. badius “foraging trails” were normally only several meters from the mound; therefore, the 2.5 m radius plots, each with an area of 19.63 m2, should have been sufficiently large to characterize the area being foraged by the ants. Although plots at sites 3 and 4 were measured two months later than plots at sites 1 and 2, it is unlikely that there was any substantial difference in vegetation between the two sampling periods because both dates occurred during the dormant winter season. Furthermore, although the vegetation at sites 3 and 4 was not systematically examined on 14 December 2006, dominant vegetation in the area was documented and agreed with the subsequent vegetative analysis done on 23 February 2007. On both sampling days, all of the identifiable vegetation was noted within each plot, and its percent cover was subjectively quantified to obtain an estimate of the dominant canopy and ground cover species at each site. A soil sample (approximately 0.50 liters) was collected from each colony at sites 1 and 2 on 14 December 2006 and atsites 3 and 4 on 23 February 2007. Diameters of craters of all colonies and heights of craters at sites 1 and 2 were measured. Representative samples of germinating seeds, viable ungerminated seeds, and charcoal pieces that were found on the craters of each colony were collected. A representative sample of pebbles found on the crater at site 2 was collected. The colony at site 2 was excavated to a depth of approximately 1.52 m, and seed caches that were found were collected for later identification. open habitat where the first Pogonomyrmex badius colony was found. Processing and Data Analysis. Species identifications of ants were made by MacGown and Hill. Voucher specimens were pinned, labeled with locality and other collecting information, and deposited in the MEM. Soil samples were analyzed by the Mississippi State Soil Testing Laboratory. Collections of seeds, which were germinated, and seedlings were grown to larger sizes in a growth chamber, and subsequent species identifications were made by Majure. Pebbles were weighed using a calibrated electronic balance, and their lengths were measured with a micrometer placed inside of an eyepiece of a Leica MZ16 stereomicroscope. Charcoal pieces were measured and identified by Seltzer using reference samples housed at the Cobb Institute of Archaeology at Mississippi State University. Pieces of charcoal smaller than 2 mm were not identified due to the lack of identifying characteristics. Pieces greater than 2 mm were examined using a comparative microscope. Digital calipers were used to measure the length (following the direction of the tangential surface) and width (following the direction of the cross sectional surface) of each piece of charcoal. Because individual weights of charcoal pieces were too small to provide accurate measurements, average weights were obtained by weighing the total sample and dividing by the number of pieces in the sample. Colony Characteristics. The colony at site 1 was in deep, fine sand on a high sand ridge approximately 2.0 m above the surface level of the adjacent gravel road, allowing for good drainage, which is necessary for this species (Tschinkel 2004). The area appeared to have been burned within the past few years, as was evidenced by the still-blackened bases of the pines in the immediate area. The subterranean nest was surmounted by a crater that was mostly circular in shape and no more than 2.6 cm in height and approximately 60 cm in diameter. It was highest at the edges and slightly depressed centrally. We observed six entrances to the colony, which were circular in shape and approximately 1.0 cm in diameter. The entire crater/mound area was covered with various pieces of soil, scattered seeds and seed remnants, small pieces of charcoal, other forms of debris (such as bits of plants), and the bodies of at least two P. badius workers. The seeds and seed husks were in discrete piles (middens) in small depressions located, apparently randomly, on the surface of the crater, especially near the edges. Several of the seeds that were scattered about the crater were sprouting. Small bits of charcoal were located mostly along the edge of the crater, with scattered bits also randomly scattered across the surface. The colony at site 2 was located in fine sand on a gradual slope at the edge of the gravel road approximately 3.0 m from what appeared to be an abandoned Pogonomyrmex nest. The crater was approximately 51 cm in diameter, approximately 2.50 cm high at its highest point on the slope and 8.0 cm, at its lowest point on the slope. Only one entrance hole was observed. Similar to the first colony, seeds and seed remnants, various pieces of debris, and small bits of charcoal were present on the crater. The colony was markedly different in appearance from the colony at site 1 in that it was covered with small pebbles of a uniform size that ranged in color from white to light orange-brown. The presence of a large number of pebbles on the crater is somewhat atypical for this species, but is much more common in various western species of Pogonomyrmex (Smith and Tschinkel 2007). The abundance of pebbles may have been simply a function of the nest being situated in an area with an abundance of suitable sized pebbles (i.e. beside a gravel road). The sample of pebbles that were collected on the surface of the crater ranged from 2.3 to 7.4 mm in longest diameter, averaging 4.2 mm (n=86), and ranged in weight from 4.1 to 87.6 mg, averaging 33.4 mg (n=86). Because the colony at site 2 was at the road edge in a very disturbed locality that would likely be adversely affected by road graders, vehicles, and/or other anthropogenic factors, and because of the ease in which we found it, which indicated a high probability that there was a healthy population of P. badius present in the area, we decided to excavate the colony to search for major workers and seed caches. Similar to findings by Tschinkel (2004), we found many horizontal chambers near the top of the nest within approximately the first 30 cm. Although we did not see large numbers of workers in this colony, they were most abundant in this upper section. In several of the chambers we observed large numbers of a small white species of Collembola, which were not collected. Two specimens of Cnemidophorus sexlineatus (L.) (Squamata: Teiidae, the six-lined race runner), were found hibernating within the colony. The first one we encountered was in a large chamber approximately 23 cm deep, and the second one was in a chamber approximately 30 cm deep. Further digging into the extremely fine sand did not allow for careful examination of the various chambers and tunnels; however, a seed cache approximately 10 cm long, 7 cm wide, and 5 cm high was discovered approximately 76 cm below the surface of the crater. Another similar sized cache of seeds was found approximately 80 cm below the surface of the crater. Several smaller caches of seeds were noted as we excavated the colony, but these were inadvertently cut apart with the shovel and were not collected. Excavation was continued to a depth of approximately 140 cm, at which point we discontinued our efforts and refilled the hole. Apparently our excavation did not disturb the colony too drastically, because on a return visit to the area on 23 February 2007, Majure noted that the colony at site 2 was still active. We discovered the colony at site 3 on the slope of a large sandhill. The colony was approximately 7.0 m from a large pile of trees, mostly Pinus sp., which had been partially to mostly burned within the previous year. Approximately 1.0 m from the colony was what appeared to be an abandoned nest of P. badius. The active colony was similar to the colony at site 1 with bits of charcoal edging the crater, various forms of debris on the crater, and small piles of seeds and seed remnants. The crater was approximately 63 cm in diameter, and we noted two entrance holes. The colony at site 4 was located approximately 15 m from the colony at site 3, separated from it by some young pines, and was approximately 8 m from the same pile of burned trees (at site 3). The crater at this colony also had bits of charcoal and other pieces of debris including piles of seeds and seed hulls. An O. pusilla plant was growing out of the center of the nest. The crater was approximately 46 cm in diameter, and three entrances were noted. Vegetative Analysis. No canopy cover was found immediately above any of the colonies themselves; however, some canopy was present within the 2.5 m radius plots at sites 1-3. Pinus echinata Mill. and Sassafras albidum (Nutt.) dominated the canopy cover in the study plot at site 1, Diospyros virginiana L. and P. taeda L. were the dominant species at site 2, P. taeda was the only canopy cover species at sites 3, and no canopy was present in the study plot at site 4 (Table 1). Table 1. Canopy cover species within the 2.5 m radius plot at each site (using the mound as the axis) and their percentage cover (subjectively determined) for sites 1-3 (no canopy cover at site 4). Because each species of plant constituting the ground cover had foliage that overlapped with other species, the percentage of ground cover totaled for all species was greater than 100% at each site. However, this does not imply that the ground was entirely covered with vegetation, as there were many bare sandy areas present. The amount of bare ground (openness) was estimated for each site and was determined to be approximately 40-50% at site 1, 60% at site 2, 30% at site 3, and only 10% at site 4. Ground cover at site 1 was dominated by Aristida purpurascens Poir. var. purpurascens, Croptilon divaricatum (Nutt. ), Digitaria cognata (J.A. Schultes), Gelsemium sempervirens (L.), O. pusilla, and Schizachyrium scoparium (Michx.) var. scoparium. Ground cover at site 2 was similar to site 1 except that Cocculus carolinus (L.) was a dominant, whereas C. divaricatum and G. sempervirens were reduced or absent. By far the most common species at site 3 was Paspalum notatum Flueggé, followed by O. pusilla and Geranium carolinianum L. Similarly, P. notatum and O. pusilla were the dominant ground cover plants at site 4. Other species also were present at sites 1-4, but were not as dominant (Table 2). Seed Analysis. Results from the seed analyses indicated that a wide variety of plants were being used by the harvester ants. Seeds and seed remnants from middens of the nest perimeter at site 1 were identified as Ambrosia artemisiifolia L., Carex sp., Dichanthelium sp., Digitaria sp., Lespedeza sp., Paspalum sp., Phytolacca americana L., Pinus sp., Rumex hastatulus Baldw., Sassafras albidum, and Scleria sp. Nest perimeter seeds and seed remnants from site 2 were identified as Dichanthelium sp., Digitaria sp., and Paspalum sp. Identifiable seeds and seed remnants collected from the colony at site 3 included Diodia teres Walt., O. pusilla, P. notatum, Pinus sp., and S. albidum. Site 4 was similar to site 3 except for the addition of Digitaria sp. and the lack of Opuntia seeds. Other unidentifiable seed remnants also were found adjacent to the craters. The seeds found in the upper cache at site 2, some of which were sprouting, included Diodia teres, Erechtites hieraciifolia (L.), Lechea sp., Phytolacca americana, Sida spinosa L., Trichostema sp. and several unidentified grasses. Seeds collected from the lower cache included the same species as in the first cache, except for the absence of Lechea sp. and P. americana. However, in the upper cache, D. teres was the most abundant species, whereas in the lower cache, S. spinosa was the most abundant species. Charcoal Analysis. Charcoal pieces from the four sites showed little diversity, with the majority of the samples made up of the southern pine group (P. echinata and/or P. taeda). In addition, small amounts of D. virginiana, Liquidambar styraciflua L., and S. albidum also were present at sites 2-4. The charcoal pieces that were collected averaged 0.01 g (for all sites, n=114) and averaged 3.73 mm in width and 3.58 mm in length (n=54) at site 1, 3.62 mm in width and 3.54 mm in length (n=11) at site 2, 3.78 mm in width and 4.06 mm in length (n=26) at site 3, and 4.11 mm in width and 4.15 mm in length (n=23) at site 4. Table 2. Ground cover species within the 2.5 m radius plot at each site (using the mound as the axis) and their percent cover (subjectively determined) for sites 1-4. Soil Analysis. The results of the soil tests showed that each of the four sites was similar in pH and soil consistency. The pH of the soil was 5.3 at site 1, 5.5 at site 2, and 5.6 at sites 3 and 4. The consistency of the soil was 88.75% sand, 10% silt, and 1.25% clay at site 1; 90% sand, 8.75% silt, and 1.25% clay at site 2; 89.5 % sand, 9.25 % silt, and 1.25% clay at site 3; and 90.5% sand, 8.25% silt, and 1.25% clay at site 4. Observations. On the 14 December 2006 visit, only small numbers of Pogonomyrmex workers were observed at sites 1-3, and they were mostly minor workers that were moving sluggishly. By the time we arrived at site 4 later in the day, however, the temperature had increased slightly, and we observed more activity with a higher number of minor workers walking around, as well as several media and major workers. Attempts were made to lure major workers from the nest at site 1 by introducing bits of cashew. Minor workers quickly found the bait and carried the pieces into the colony, but no majors emerged from the nest to aid in carrying the cashew bait. At site 1, we observed workers carrying germinating seeds from the interior of the nest to the outside, where they were placed in the middens. Similar behavior of this species was documented by Stamp and Lucas (1990). We also observed that many of the workers at each site were walking with their gasters curled underneath the body. Unlike many species of Pogonomyrmex, P. badius typically lacks propodeal spines, although the occasional presence of abnormal spines in this species has been documented (Olsen 1934, Cole 1968, Taber 1998). Most of the specimens collected by Majure on the first visit to the site lacked spines; however one major and one minor were found to possess them. The spines were located posteriodorsally near the propodeal declivity and their placement was unusual in that both specimens had two spines on one side of the propodeum and only one on the other side. On the second visit to site 1, three additional workers (one major and two minors) were collected with similar aberrant spines. Several other species of ants were collected as they roamed freely over the Pogonomyrmex craters including Forelius mccooki (McCook) (site 3), Dorymyrmex bureni (Trager) (sites 1-4), Prenolepis imparis (Say) (sites 1, 2, and 4), Cyphomyrmex rimosus (Spinola) (site 1), Stenamma foveolocephalum Smith(site 4), Solenopsis invicta (sites 1-4), and Pheidole bicarinata Mayr (sites 1 and 2). Forelius mccooki is a common species found in a variety of open habitats including sandy areas; D. bureni is a common sand inhabiting species, P. imparis is a common species that is most active during the cooler months of the year, C. rimosus is an exotic species that is now very common in the southern third of the state, S. foveolocephalum is a cool weather species that is uncommon and previously only known in Mississippi from Winston County, S. invicta (the introduced red fire ant) is ubiquitous throughout southern Mississippi, and P. bicarinata is a common native species associated with open areas. In addition to other species of ants that were collected, Poecilocrypticus formicophilus Gebien (Coleoptera: Tenebrionidae), a beetle supposedly associated with the imported fire ants (MacGown 2005), was collected as it crawled around the perimeter of the colony at site 1 near the midden areas. This species has also been observed crawling among fire ant (S. invicta) carcasses in middens of another exotic ant species, Pheidole obscurithorax Naves, at Paul B. Johnson State Park in Forrest County, Mississippi (JAM and JGH, unpublished data). The serendipitous discovery of the Pogonomyrmex colony by Majure shows that although P. badius is apparently scarcer in Mississippi than it once was, it still occurs in the mainland portions of the state. News of this discovery was given to other researchers in the state also working in sandhill habitats, so that they could look for additional populations of this species. As a direct result, isolated populations of this species were discovered by Tom Mann and Heather Sullivan (researchers for the Mississippi Museum of Natural History), while searching for gopher tortoises (Testudines: Testudinidae, Gopherus polyphemus), at 10 distinct localities in Harrison, Lamar, Pearl River, Perry, and Stone Counties in 2007 (Tom Mann, personal communication). Similar to our study sites in Smith County, these sites were in relatively open pine/turkey oak habitat with well-drained sandy soil, but differed in that the soils were of Alaga, Lakeland, Smithdale, or Troup formations, rather than Citronelle. Mann (personal communication) stated that although many sand deposits have been surveyed, P. badius was found only at 10 sites, and multiple colonies were found only at two sites. Mann stated that imported fire ant populations at most of the sites were at low densities. An additional colony on Petit Bois Island, off the coast of Jackson County, was discovered by Victor Maddox in 2007 and reported to the MEM (see Fig. 3 for historic and current distribution of P. badius in Mississippi). Major factors for the survival of P. badius in Mississippi appear to be the existence of open habitat, possibly maintained by burning; extremely well-drained soil with deep fine sand; the availability of food resources including seeds from various plants (especially grasses); minimal pesticidal treatments; and possibly, a somewhat minimized introduced fire ant population. One explanation for the apparent decline of P. badius in some regions of Mississippi may be habitat conversion. In many parts of the state, areas with well-drained, sandy soils have been converted to intensive agriculture or forestry regimes. Additionally, some sandhill communities have been negatively impacted by poor forestry practices, which have led to additional habitat loss by erosion. Mining for sand, gravel, and other minerals has also contributed to habitat loss. Further loss of habitat can be attributed to construction of houses, businesses, and roads and highways. It should be noted, however, that P. badius can exist in somewhat disturbed areas such as roadsides, fire-lanes, edges of agricultural fields, lawns, or other similar situations, if the habitat is sufficiently open, has deep sand, and available food resources. Observations by other researchers have shown that densities of P. badius colonies are positively related to the frequency that the habitat is burned (McCoy and Kaiser 1990). Periodic burning of preferred habitats may be necessary to keep areas open, as well as to provide a source of charcoal, which the harvester ants spend considerable time gathering and then scattering across their craters. It is has been suggested that P. badius mayinfuse the charcoal with some type of chemical deterrent, which may mark their territory or deter conspecifics, as well as other species of ants (Gordon 1984). However, a study by Smith and Tschinkel (2007) showed it was unlikely that the charcoal deterred ants, but instead, attracted some species. Some of these same species attracted to charcoal were also observed foraging for food on the harvester ant craters. Smith and Tschinkel (2007) also noted that the charcoal slightly increased the temperature of the top few centimeters of nest soil during certain parts of the day, which may have increased total available time of activity for the colony, but that hydrology of the nests was not affected by the charcoal. Their research suggested that the gathering of charcoal may be an ancestral trait in P. badius and is in part related to its foraging and trash disposal behaviors. Regardless of the reasons why P. badius gathers charcoal, there appears to be little or no mention of species of plants used for this purpose in the literature. In our study, we noted that the majority of the charcoal pieces sampled were from the southern pine group, although, three other species of trees were also utilized, which demonstrated that the Florida harvester ant used charcoal from a variety of plant species. Results from the seed analyses indicated that a wide variety of plants were being used by the harvester ants. It also allowed for the detection of plant species that are otherwise dormant at this time of year (i.e. winter). Interestingly, seeds collected from the caches within the nest at site 2 were all of different species than those found in the middens on the crater of the same colony. In fact, three species from the caches, E. hieraciifolia, S. spinosa, and Trichostema sp., were not found within the 2.5 m radius plots at any site. The historic injudicious application of insecticides for controlling fire ants may have negatively impacted P. badius, but this type of control is now no longer a common practice. Whether or not competition from the imported fire ants played a significant role in the harvester ant's disappearance is debatable. A study by Hook and Porter (1990) showed that invading fire ants negatively impacted harvester ant colonies in Texas. Recent studies, however, have shown that imported fire ants may not have as much of a negative effect on native ant species as previously thought (Helms and Vinson 2001, Morrison 2002, Morrison and Porter 2003, King and Tschinkel 2006, MacGown and Brown 2006, Hill et al. in review). Many of the historic collection sites in Mississippi where P. badius was once found, but is now apparently absent, may represent marginal habitat for the species, and may be better suited for S. invicta, S. richteri, and their hybrid to thrive. Conversely, although imported fire ants manage to exist in habitats with deep sand, they do not appear to be as dominant as they are in other open habitats, and their possible negative influence on other ant species may be lessened. At our study site in Smith County, fire ant abundance was minimal; however, this may have been a result of the time of year when the collections were made as fire ants are not typically as active in the winter as in the warmer seasons. Mann (personal communication), whose collections were made in the summer, also noted low densities of fire ants at the localities where he found P. badius. The fact that P. badius has recently been found in 12 different localities in southern Mississippi makes it seem likely that this species has been present, albeit in small and isolated populations, throughout the last 70 years in the state. Its apparent absence was likely the result of a lack of intensive collecting in relic sandhill localities. Compared to typical densities of this species at given localities seen in Alabama, Florida, and Georgia by the authors, its abundance in Mississippi appears to be at a critically low level. Continued disappearance of preferred habitat, sand-pit construction, lack of appropriate burning, and continued invasions of non-native species (both plant and animal) will likely reduce populations further. Consequently, this species is under consideration for addition to the state endangered species list (Tom Mann, personal communication). We thank Matt Sullivan for allowing us to collect on his family's land in Smith County and showing us potential nest sites. Thanks to Tom Mann and Heather Sullivan for their information and collections of P. badius in Mississippi, and to Victor Maddox for his information on finding this species on Petit Bois Island, Jackson County. This article is approved for publication as Journal Article No. 11142 of the Mississippi Agricultural and Forestry Experiment Station. Research was supported by State Project MIS-311080, USDA-ARS Areawide Management of Imported Fire Ant Project (Richard L. Brown, Principal Investigator), and by the US Geological Survey Biological Resources Division (grant no. 04HQAG0135, Gary N. Ervin, Principal Investigator). Cole, A. C., Jr. 1968. Pogonomyrmex Harvester Ants: A study of the genus in North America. University of Tennessee Press. Knoxville. Gordon, D. M. 1984. Harvester ant middens: refuse or boundary? Ecol. Entomol. 9: 403-412. Harrison, J. S. and J. B. Gentry. 1981. Foraging pattern, colony distribution, and foraging range of the Florida Harvester Ant, Pogonomyrmex badius. Ecology 62: 1467-1473. Helms, K. R. and S. B. Vinson. 2001. Coexistence of native ants with the red imported fire ant, Solenopsis invicta. Southwest. Nat. 46: 396-400. Hill, J. G., K. S. Summerville, and R. L. Brown. (In Review). Habitat associations of ant species (Hymenoptera: Formicidae) in a heterogeneous Mississippi landscape. Submitted to Environ. Entomol. Hook, A. W. and S. D. Porter. 1990. Destruction of harvester ant colonies by invading fire ants in south-central Texas (Hymenoptera: Formicidae). Southwest. Nat. 35: 477-478. King, J. R. and W. R. Tschinkel. 2006. Experimental evidence that the introduced fire ant, Solenopsis invicta, does not competitively suppress co-occurring ants in a disturbed habitat. J. Anim. Ecol. 75: 1370-1378. Lockley, T. 1999. The terrestrial arthropods of Horn Island, MS: A comparison with a survey conducted between 1943 and 1961, pp. 112-115. In: A. A. Callcott and H. L. Collins [eds. ], Accomplishment Report. Gulfport Plant Protection Station: Center for Plant Health and Technology. PPQ, USDA. Gulfport, MS.
Luper, E. E. 1972. Smith County Geology and Mineral Resources. Mississippi Geological, Economic and Topographical Survey. Bulletin 116. MacGown, J. A. 2005. A collection of Poecilocrypticus formicophilus Gebien (Coleoptera: Tenebrionidae) from a mound of the imported fire ant hybrid, Solenopsis invicta X richteri (Hymenoptera: Formicidae) in Mississippi, USA. Entomol. News 116: 367-368. MacGown, J. A. and R. L. Brown. 2006. Observations on high diversity of native ant species coexisting with imported fire ants at a microspatial scale in Mississippi. Southeast. Nat. 5: 573-586. McCoy, E. D. and B. W. Kaiser. 1990. Changes in foraging activity of the southern harvester ant Pogonomyrmex badius (Latreille) in response to fire. Am. Midl. Nat. 123: 112-123. Morrison, L. W. 2002. Long-term impacts of an arthropod-community invasion by the imported fire ant, Solenopsis invicta. Ecology 83: 2337-2345. Morrison, L. W. and S. A. Porter. 2003. Positive association between densities of the red imported fire ant, Solenopsis invicta (Hymenoptera: Formicidae), and generalized ant and arthropod diversity. Environ. Entomol. 32: 548-554. Nickerson, J. C. 1987. The Florida harvester ant, Pogonomyrmex badius (Latreille) (Hymenoptera: Formicidae). Florida Department of Agriculture and Consumer Service, Division of Plant Industry. Entomology Circular No. 297. Olsen, O. W. 1934. Notes on the North American harvesting ants of the genus Pogonomyrmex Mayr. Bull. Mus. Comp. Zool. 77: 493-514. Smith, C. R. and W. R. Tschinkel. 2007. The adaptive nature of non-food collection for the Florida harvester ant, Pogonomyrmex badius. Ecol. Entomol. 32: 105–112. Smith, D. R. 1979. Superfamily Formicoidea, pp. 1323-1467. In K.V. Krombein, P. D. Hurd, Jr., D. R. Smith, and B. D. Burks [eds. ], Catalog of Hymenoptera in America North of Mexico, Vol. 2: Apocrita (Aculeata). Smithsonian Institution Press, Washington, D. C.
Smith, M. R. 1924. An annotated list of the ants of Mississippi (Hym.). Entomol. News 35: 47-54. Smith, M. R. [Collection notes of Marion R. Smith]. Mississippi Entomological Museum, Mississippi State University, MS. Stamp, N. E. and J. R. Lucas. 1990. Spatial patterns and dispersal distances of explosively dispersing plants in Florida sandhill vegetation. J. Ecol. 78: 589-600. Taber, S. W. 1998. The World of the Harvester Ants. Texas A. &M. University Press, College Station. 232 pp. Tschinkel, W. R. 1999. Sociometry and sociogenesis of colonies of the harvester ant, Pogonomyrmex badius: Distribution of workers, brood and seeds within the nest in relation to colony size and season. Ecol. Entomol. 24: 222-237. Tschinkel, W. R. 2004. The nest architecture of the Florida harvester ant, Pogonomyrmex badius. J. Insect Sci. 4: 21: 1-19. Tschinkel, W. R. 2006. The Fire Ants. Harvard University Press, Cambridge, MA. 723 pp. Wray, D. L. 1938. Notes on the southern harvester ant (Pogonomyrmex badius Latr.) in North Carolina. Ann. Entomol. Soc. Am. 31: 196-201.